This Small Batch of Cut-out Sugar Cookies recipe makes just 8 to 12 perfect sugar cookies and is quick and easy, with no dough chilling time required! Preheat the oven to 375°F and line two baking sheets with parchment paper or silicone baking mats. In a medium bowl, combine softened butter and sugar. With a handheld electric mixer on medium, cream together until light and fluffy, about 1 minute. Add egg yolk and vanilla and mix until well-combined. Add 1/3 of the flour mixture, and mix on medium until mostly combined. Add half of the remaining flour and repeat. Pour in the rest of the flour and continue to mix until the dough begins to clump (this may take a little while) and you can form it into a ball with your hands. Lightly flour your workspace and rolling pin and roll dough out to just under 1/4-inch thick. 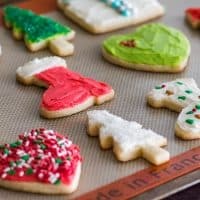 Dip cookie cutters in flour and cut out your cookies, placing them at least an inch apart on the trays. Use a metal spatula to pick up the cookies if they stick to your work surface at all. Continue to cut out cookies, gathering dough and re-rolling as necessary until all the dough is shaped. Bake cookie sheets, one tray at a time, for 6 to 9 minutes, until the edges of the cookies just start to turn golden. Cool completely before frosting. And enjoy! If you don't own a handheld electric mixer, you can make these cookies by hand, but to get the dough to come together, you may need to wet your hands with water and knead the dough into a ball at the end.